To the best of my recollection, I haven’t previously encountered the music of James Francis Brown. I see, though, that my colleague William Hedley gave a warm welcome to a disc of his chamber music a few years ago. Though I may not have heard his own music before I have experienced his work as an editor of some early orchestral scores by Vaughan Williams (review ~ review). I think it’s relevant to mention that VW connection, not because Brown’s music sounds like that of Vaughan Williams but because this disc shows him to be a skilful and tasteful orchestral composer. A common thread binds the three works on this disc: all three were written to commissions and received their first performances at the Presteigne Festival. That small Welsh market town in the county of Powys, near the border with Herefordshire, has had a thriving arts festival for many years now. The Festival was established in 1982 and George Vass has been Artistic Director since 1992. James Francis Brown is one of many contemporary composers whose music has featured on programmes in Presteigne. The first piece on this disc is the Trio Concertante. Two of the soloists here, Benjamin Nabarro and Gemma Rosefield are members of the Leonore Piano Trio and by coincidence shortly before settling down to evaluate this disc I greatly enjoyed the Leonore’s new CD of piano trios by Sir Hubert Parry (review). Here, with a different partner in the shape of Rachel Roberts, they combine just as effectively as a team of three. The Trio Concertante is a single-movement work, in which the soloists are joined by a small string orchestra, and it’s a delight. From the outset the three soloists have long passages of easily-flowing cantabile lines. The solo parts interweave in a winning fashion and the way in which Brown has his orchestra either contrasting with or complementing the soloists is very convincing. There’s a very strong and highly attractive melodic thread running through the whole work. At 6:33 a lovely, ruminative episode is introduced by the viola – the instrument’s husky, soulful tone is ideally suited to the material. The other solo instruments join in after a while. The section includes a cadenza-like passage for the cellist and, indeed, all three soloists have opportunities to shine individually. At 11:30 the music reverts to the material and spirit of the opening section, led off by the solo violin. The remainder of the piece is lively and smiling. The Trio Concertante is a piece that will give great pleasure but that doesn’t mean it’s lightweight in any way. I can pay the work and its composer no higher compliment than to say it is right there in the fine tradition of English works for strings. In the composer’s words, the Clarinet Concerto “is concerned with the imaginative ‘pull’ of a significant place”. The place in question is the small village of Ingworth in North Norfolk, situated about 14 miles north of Norwich. Brown describes it as “[a] remote place that has had a profound influence on my creative outlook”. By one of life’s great coincidences he discovered that Catriona Scott, the soloist here and at the first performance at Presteigne in 2008, had strong childhood links with the village also. The concerto has four movements but it plays continuously with each movement joined to the next by an interlude for the solo instrument. The soloist is accompanied by a string orchestra. Each of the movements has a title, every one of which has a personal significance, as explained in the booklet by the composer. The first movement is a “gently breezy evocation” of that part of Norfolk. Brown exploits both the nimble and singing facets of the clarinet while the string orchestra’s contribution is skilfully calibrated. The second movement describes a rather unsettling experience that Brown had during a walk at dusk one January evening. The orchestral contribution is shadowy and somewhat ominous while the solo part is anxious and restless. The third movement is inspired by the Ingworth church and the people who’ve frequented it down the ages. It’s primarily meditative in character though there’s quite a powerful climax. The final movement opens with a luminous yet animated passage for the orchestra. Thereafter, the clarinet dominates proceedings, mainly in cantabile vein. This finale has its lively moments but the work ends, most effectively, in a subdued fashion. This is an admirable concerto which I liked very much. The Heavens and the Heart is a three-movement work for mixed chorus and small orchestra – a pair of horns and a harp are added to the string band. Each of the three movements sets lines in Latin from a different psalm. The first movement takes lines from Psalm 19 (‘The heavens show forth the glory of God’). The music is vigorous and there’s ample energy both in the music and in the performance. The second movement takes lines from Psalm 58 (Are your minds set upon righteousness.….?’). The composer comments that the psalm “is a scathing attack on the deceptive rhetoric of rulers and is unnervingly pertinent today”. From that you might expect – as I did – powerful, raging music. In fact, Brown is more subtle than that and for the most part the tone of the piece is quite subdued. If you listen carefully, though, there’s plenty of tension under the surface. And at one point towards the end (‘Break their teeth, O God, in their mouths’) the music becomes appropriately fierce. Finally, there is a setting of words from Psalm 92 (‘It is a good thing to give thanks unto the Lord’). This is a joyful conclusion to the work, the celebratory aspect heightened by Brown’s decision to interpolate as a refrain the words ‘Hosanna in excelsis’. The Royal Holloway choir, which sings at their usual top-class standard throughout the work, makes this last movement properly exultant. The Heavens and the Heart is a good piece. The choral writing is effective and interesting, as are the orchestral parts. Like its two companions on the disc, this is a work of strong appeal to listeners and I enjoyed it. This is a highly successful disc. All three works are attractive and expertly crafted; they display a composer with a fine melodic gift and one who is able to connect and communicate with his audience very directly without any sacrifice of musical principles. James Francis Brown has been very well served by all the performers. 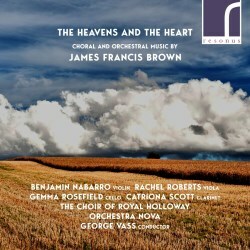 The four instrumental soloists are excellent, Orchestra Nova makes a splendid contribution throughout and the singing of the Royal Holloway choir in The Heavens and the Heart is similarly first class. Adam Binks’ recordings capture the performances in excellent, sympathetic sound. The composer’s notes provide a good, clear introduction to the music. The booklet also includes an endorsement of Brown’s music from his friend and fellow composer, David Matthews. The music we hear justifies the enthusiastic tone of Matthews’ short essay. If, like me, you haven’t heard previously the music of James Francis Brown, I urge you to try it; this disc is a fine introduction to his art.